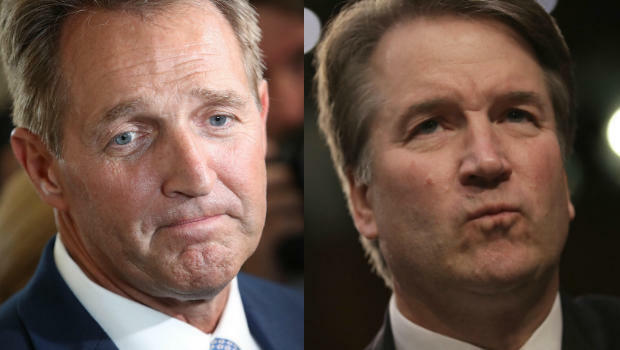 Jeff Flake on Kavanaugh confirmation: "We can't vote until we hear more"
Arizona Republican Sen. Jeff Flake is calling for a delay in the vote by the Senate Judiciary Committee on Brett Kavanaugh's nomination to be a Supreme Court justice. Flake told the Washington Post he thought the committee should hear from the woman who has accused Kavanaugh of sexual misconduct when the two were in high school. "I've made it clear that I'm not comfortable moving ahead with the vote on Thursday if we have not heard her side of the story or explored this further," Flake told the Post in an interview Sunday. Flake sits on the Judiciary Committee and is part of the committee's one-vote majority over Democrats. Following committee action on Kavanaugh, it will be up to Senate Majority Leader Mitch McConnell to schedule floor debate and a vote. McConnell could start the floor process on the Kavanaugh nomination as early as Thursday afternoon and the debate and final confirmation vote would happen during the week of Sept. 24. The woman who made the accusation, Christine Blasey Ford, came forward in an article published Sunday by the Washington Post. Flake told the Post that Ford "must be heard" and said, "for me, we can't vote until we hear more." He did not tell the Post what form that communication should take — whether she should be interviewed by senators or committee staff or testify. Two Republican senators whose votes are considered crucial commented Sunday. Alaska's Lisa Murkowski told CNN, "This is not something that came up during the hearings. The hearings are now over. And if there is real substance to this, it demands a response. If there are more questions that need to be asked and answered, then I think it would be appropriate for that time." And Maine's Susan Collins remarked to CNN that she's "going to be talking to my colleagues. I did ask, I did read the letter last week and asked the judge in a telephone conversation on Friday about it and he was very emphatic about it in his denial." Does she believe the accuser? "I don't know enough to make a judgment at this point," Collins replied. Tennesse Republican Sen. Bob Corker was more definitive, telling Politico a delay "would be best for all involved, including the nominee. If she does want to be heard, she should do so promptly." Judiciary Committee Chairman Charles Grassley, a Republican from Iowa, and Dianne Feinstein, the highest ranking Democrat on the committee, have been working to set up follow-up calls with Kavanaugh and Ford, Committee spokesman Taylor Foy said in a statement. Foy said that the two routinely hold bipartisan staff calls with nominees when updates are made to their background files. He also wrote, "It's disturbing that these uncorroborated allegations from more than 35 years ago, during high school, would surface on the eve of a committee vote after Democrats sat on them since July." Sen. Lindsey Graham, R-South Carolina, who also sits on the Judiciary Committee, said in a statement that while he agrees with the committee's stated concern "about the substance and process regarding the allegations in this latest claim," he "would gladly listen to what she has to say and compare that against all other information we have received about Judge Kavanaugh." Graham said if the committee is to hear from Ford, it should be "done immediately so the process can continue as scheduled." A lawyer familiar with the Kavanaugh nomination process said the White House knows the situation is tougher, but that the White House remains fully committed to Kavanaugh. The lawyer thinks there's no reason at this time to assume that Thursday's committee confirmation vote will be delayed. President Trump's attorney Rudy Giuliani told CBS News that Kavanaugh's nomination "will not" be withdrawn "as far as I know." Paula Reid, Major Garrett and Steven Portnoy contributed to this report.